Details: Carved stone entry and trim, pointed arches. Historic Features: Decorative entry, towers. 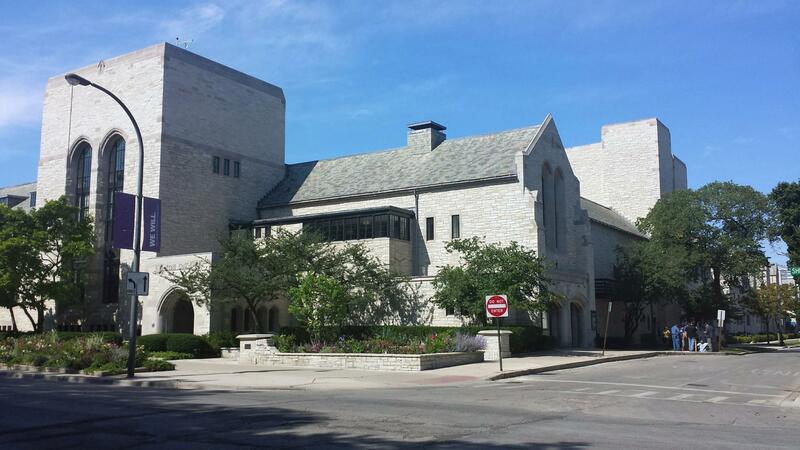 Original Owner: Northwestern University, "Scott Hall/Cahn Auditorium"
Other Permit Information: 1963: Electrical work done at SW corner of Sheridan Road and Northwestern University. New condensation and vacuum pumps in vault under sidewalk. 1982: Bldg Permit #66690: Renovation of stage and house lighting. COA Info: 13PRES-0087: Masry repairs and steel windows restoration (new clear glass will be installed at all windows), new privacy glass where existing, interior storms and screen windows will be installed, with divisions to match that of the primary windows, rf repairs, dr repair and repainting the existing metal elements; 13PRES-0088: Masry repairs and steel windows restoration (same as 13PRES-0087); 13PRES-0027: Masry repairs and window restoration, rf repairs, dr repair and repainting of existing metal elements.